ALBUQUERQUE - Abdullah Ayazi left Afghanistan in 1983, escaping Russian-occupied Kabul with an older brother. He's been homesick for 18 years. So for the past three years, Ayazi has been going home - but only on paper. Ayazi, an electrical engineer now living in Albuquerque, in 1998 started working on a meticulously researched map of Afghanistan. He had been unable to find a carefully rendered map of Afghanistan, so he decided to make one himself despite a complete lack of experience as a cartographer. He finished the glossy, full-color map this summer and maxed out his credit cards to print 10,000 copies. Then the maps gathered dust. Ayazi, 38, feared he'd printed a few too many. Since Sept. 11, however, Ayazi has become the purveyor of an unexpected best-seller. Local stores can't keep the 28-by-40-inch map on the shelves, and one hangs on a wall at the Pentagon. 'The timing was pretty amazing,' said Kathy Bullard, director of map and book sales for Holman's Inc., Albuquerque's best-known map outlet. 'There really wasn't much on the market in the way of maps of Afghanistan, and we didn't know how to fill that void when the demand got so high after Sept. 11. Ayazi's map features more than 2,500 cities, towns and villages, as well as swamps, oil and gas pipelines, historical shrines and monuments, dirt roads, and military bases. It also sports a historical timeline, cultural tidbits and historical information. One thing that makes this map unique, Ayazi said, is his attention to changes in the country since the Russian occupation. 'A lot of things are different,' he said. Ayazi's engineering work had given him some drafting experience, but 'that was mostly drawing lines and conduits,' he said. He relied on map-making computer software to help him get the map's technical aspects right. The map took him three years of weekends, often working through the night, for a total of about 3,000 hours. Even though the map is completed, Ayazi's weekends won't be free for a while, much to the dismay of his wife, Zarghanah, and their three daughters, ages 2, 4 and 6. He's now busy learning Web-page design so he can get his website, www.afghanmap.com, up and running. 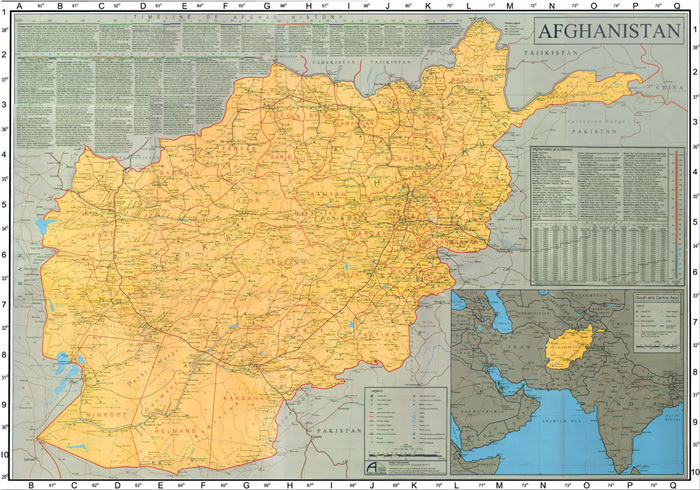 Although he expects to sell his map mostly to people curious about Afghanistan, as well as native Afghans now living in the United States, Ayazi also sent copies to the State Department and the Department of Defense. 'It has heartened the military and civilian personnel who see it and reminded us all once again of the solidarity of the American people in the wake of the attack on our great nation,' he wrote. Ayazi's map is available online through his e-mail address: afghanmap@yahoo.com.